Small pieces of fish dipped in batter and fried in deep oil is a delicious and quick way to prepare fish in an unusual way in our country. In Greece, this dish is very popular and served, for example, with skordalią - Greek garlic sauce. The dough draws all the smells from the fish and emphasizes the delicacy of the meat. It's best for frying fish with white rather thick meat such as monkfish, cod or ordinary miruna. 1. We start with preparing the dough. In a large bowl, mix the flour with salt and pepper first, then inside the bowl to pour the egg and olive oil. The mass should be started gradually with a mixer, adding water slowly. When we get a smooth, semi-solid mass, you can proceed to the next part. 2. The fish are cleaned of bone and skin and cut into small pieces. Then sprinkle them with flour to make the dough stick to the fish. 3. Heat the frying oil in a deep container until the thrown in piece of bread is browned in one minute. When the oil reaches the right temperature, dip the pieces of fish in the dough and then translate it into a deep oil. The fish should be fried in small portions for about 5 minutes, until the golden color is reached, the dough should be crisp. The pieces of fish should be removed with a slotted spoon and each of them should be well drained on a paper towel. 4. The fish is served in hot batter with drizzled lemon juice, for example with fried Greek potatoes or skordalią and vegetables. Dorada is a delicious fish popular in Mediterranean cuisine, including Greek cuisine. The extraordinary taste of its juicy but firm meat makes them the easier way to prepare, the more we will be able to enjoy its qualities. The inspiration was always provided by Greek cuisine. Southerners know very well that fresh fish do not need too many treatments to taste great. The regulars of Crete and Greece know the gemista dish well, ie stuffed peppers, zucchini or tomatoes. This great tasty dish can be prepared both in the vegetarian version and with meat. In both cases it is just as delicious. 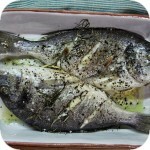 This is one of our favorite recipes for Greek fish dishes. It comes from the tiny island of Spetse located on the Halkidiki peninsula. It's an extremely delicious and quite simple dish that does not require the addition of sophisticated ingredients. Originally the Greeks sprinkle the fish with breadcrumbs at the end of baking. However, I do not do it, but instead adds Cretan fish soup to the sauce and a sprig of fresh rosemary. There are quite a lot of ways to make this dish, so I think that this small modification will not hurt, and I do not commit barbarism against this recipe.